I started going to church when I was an infant. We had something called the Cradle Roll at the church I grew up in, and I was enrolled at a few months old. Which means that I have been going to church for almost 47 years now. That’s almost 2,500 Sundays. I guess you might expect that from a pastor/minister/preacher. But I think for lots of people, going to church has been a pretty normal part of their Christian experience. “What if the form of Christianity commonly practiced by us… bears little – if any – resemblance to the way of Jesus and the kingdom he came to earth to usher in? 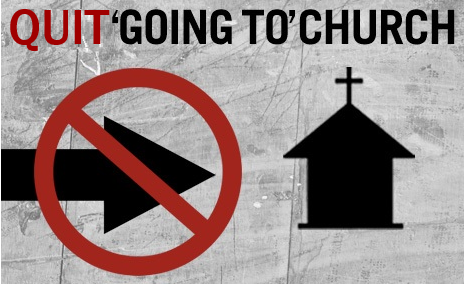 So starting Sunday, October 4th, join us as we explore the idea that we should “quit going to church.” And yes, I get that it is more than a little ironic that I’m inviting you to come the church to do it.